Well hello there, Monday! I for one am happy today is Monday. It means that we not only survived the weekend, but that we’re one week closer to this deployment ending. Oh yeah…the deployment. I wasn’t planning on writing this post for another few weeks, but the military had other (very last minute) plans for us. We knew my husband would be leaving at the end of the month, so we were preparing for that. There was a to-do list with items being crossed off every day, there was a weekend trip away for the holiday weekend, and mentally, we started preparing ourselves for our inevitable time away. But then my husband said there’d be a chance he may have to leave early. He insisted that it probably wouldn’t happen, but I knew better. I quickly revised the to-do list and moved higher priority items to the top, and we kicked things into high gear, just in case he was called up two weeks early (the newly proposed timeline). With two weeks to spare, we started making plans for the weekend and even planned a date night. Silly, silly us. A few days after he told me about the early possibility, I got a text asking me to call his office. I called and he told me he was slated to leave in 48 hours. I almost laughed and asked if he was kidding, but then I remembered a very solid rule in our house: never joke about deployments. So, with that bit of knowledge, I told him okay (it’s not like whining or protesting it would change anything) and held back the tears. He told me he was sorry and that he loved me, and that’s where I lost it and let the tears fall. He wrapped up the call and said he’d be home soon, but he had to finish a lot of things at work. All in all, he ended up spending around eight hours between that day and the next getting prepped for the deployment. We knew he’d leave sooner rather than later, and since I was already prepared for him to leave anyway, I figured I’d be okay with it…and I was, until the two-day notice popped up. Bella totally has a sixth puppy sense for when he’s leaving. Two days isn’t much time to get things in order. When he was home, he was scurrying around packing, finishing some last-minute things around the house, and spending as much time with Julia as he could. 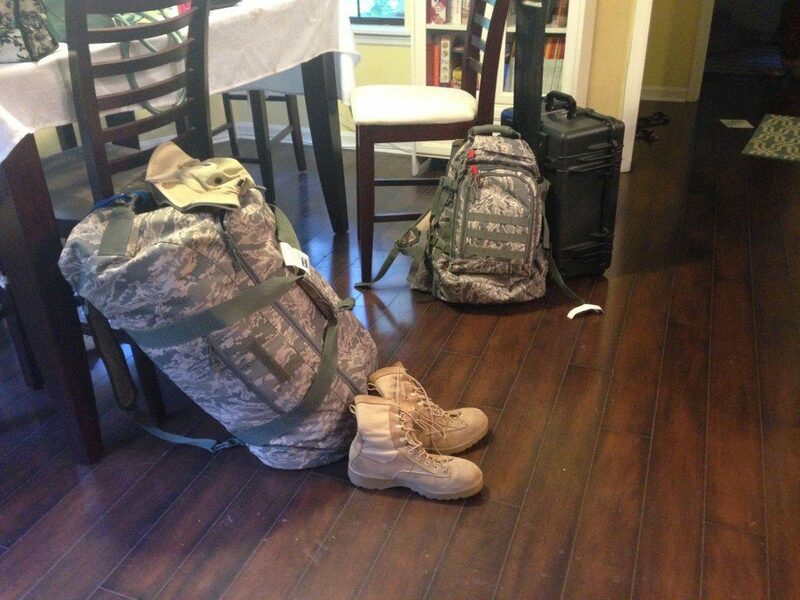 On the bright side, he left before the dreaded pre-deployment arguments and fighting could occur. On the downside: he left the house a mess. We usually put all of his crap away so I’m not reminded of him with every step I take, but he left so quickly that cleaning up didn’t happen. Blergh. This is our sixth deployment and, as always, the lead-up to him leaving and the day of is always the toughest part for me. Looking back on it, I’m actually thankful for the 48-hour notice, because it let me rip that band-aid right off. Do I wish this upon anyone else? Absolutely not, and I would absolutely rather have him home with me right now. But like I said, we knew this deployment was coming. I think that’s the difference between this time around and our last short-notice deployment. Minutes before we said our goodbyes. I’m so thankful she’s young enough to not really process what’s going on. So now that he’s gone, Julia and I are figuring out our new normal. This separation won’t be as long as the last time, so I feel like we have a pretty good handle on the time. I dug out my planner this morning and filled it up as best I could. My mom is also coming out here in August, and then I’m going home to visit for a couple weeks in September/October. Technology is basically the best thing in the world, since we’ve already been able to FaceTime with my husband a couple times. That’s what’s going on over here. Sorry for the silence lately, but I was spending more time with my family than on the blog (not that I need to apologize for that). I can’t promise posts will be back up to par in the coming weeks, mostly because chasing a toddler all day drains my brain cells at night and all I want to do is watch The Big Bang Theory and Modern Family, but I did add blogging to my schedule, just to keep me accountable. Writing has always been my outlet, so I need to make time for it. 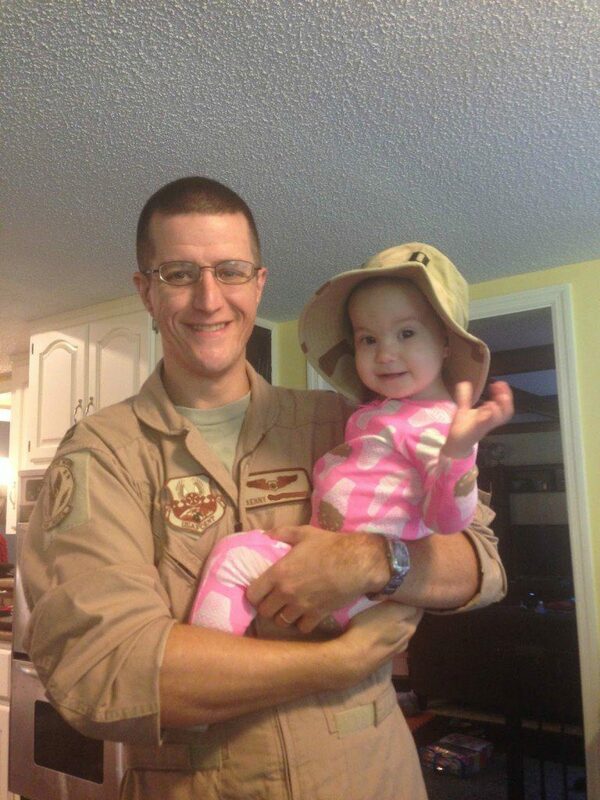 Are you going through a deployment right now or have tips for making it through the next several months with a toddler?! I’d love to connect with you in the comments below! Thinking of you and your family. As a military wife and mom I know how hard it is. Thank goodness my husband is retired. Just like the other kabillion other military spouses and family members would say, we take care of our own, so we are here for you! Thank you so much, Daisy. The military (and online) community is simply amazing. Gotta love the Air Force. Hoping the days pass quickly, and praying for a safe return. The picture for this post hit my FB feed and I immediately wanted to hug you. Love and hugs to you all!!! Yikes. I hope time passes quickly and he returns safely. 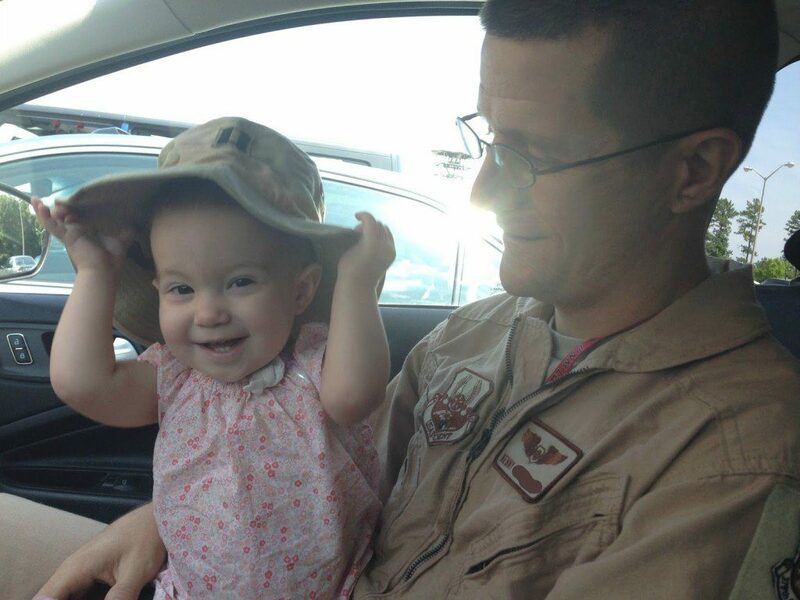 My advice is to take advantage of respite care at the CYS, free daycare and mommy time is always needed during a deployment. Excellent advice, thank you! I just got some information about parent's night out happening in August, so I'll definitely take advantage of that! Oh goodness – 48 hours?! Thats some tough stuff! Thinking about you and Julia, and hoping the time flies by! So I think my comment just disappeared as it was being published…if you get this twice…blame blogger! DARN YOU, AIR FORCE! They've got the greatest timing, don't they? 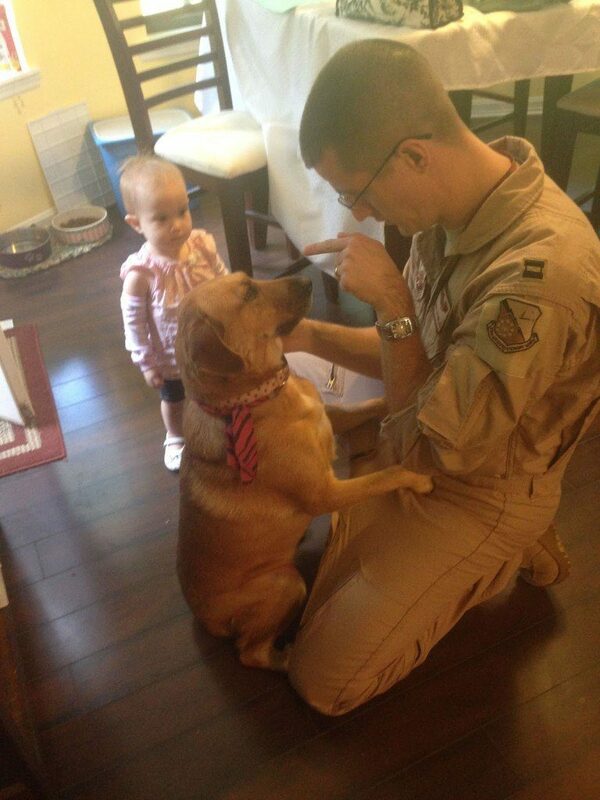 I know you're going to rock this deployment, just like you've rocked all the other ones. And now you've got little miss Jules to keep you company! I hope the days pass quickly and smoothly until his return. And remember, I'm just a phone call away!! If you ever need to just do some random talking to an adult let me know, I am home alone most days and am just a Skype away and with the time difference it works if you are up early with Julia and everything is still closed! It is such a shock when plans change, even when you're anticipating it. Brandon's have changed last minute so many times… including this last time when he was coming home early, then he wasn't, and then THAT DAY he said he was coming home. Geez. Hang in there and you know you can always chat me up if you need someone! Yikes, 48 hr notice? 🙁 I wish I could hug you right now – sending so much love your way and hope this passes quickly! I've done the Pregnant with a Toddler During a Deployment gig and it's exhausting. Ask for help, pay for help, send Julia to a few hours of day care, do whatever you need to in order to look after you. The truth is that it only gets more exhausting from here out (until the little one sleeps through the night/Julia has all her teeth), and taking care of yourself is hugely important to your family.